(Reuters) - Last year the Haida, an indigenous group in Canada, set out to increase their salmon stocks and save the planet. Helped by American businessman Russ George, a group of villagers dumped 100 metric tons (110.23 tons) of iron dust from a boat into the Pacific Ocean. They wanted to see if the iron would cause a bloom of algae that could promote fish numbers and absorb the greenhouse gas carbon dioxide from the atmosphere. Instead, in March, they were raided by Canadian officials for illegal dumping at sea. "I think they (the officials) kind of expected to see Dr. Evil and his group planning to destroy the Earth with geoengineers," said James Straith, lawyer for Haida Salmon Restoration Corp. (HSRC), as the project called itself. "What they got was a bunch of nice kids doing a lot of things on plankton scanning, scientific models and analyzing data... Did the officials really need bullet-proof vests?" The Haida case highlights a growing legal, environmental and even geo-political conundrum. The Canadian group is part of a debate about geoengineering - deliberate and sometimes sci-fi-like interventions designed to slow climate change. A U.N. panel of climate scientists says carbon dioxide and other gases are causing global temperatures to rise and change our climate and will lead to more heat waves, droughts, floods and rising seas. Geoengineers have proposed everything from brightening clouds to reflect more sunlight and heat back into space to - as in the case of the Haida - encouraging the oceans to soak up more carbon dioxide. The idea behind the ‘ocean fertilization' experiment was simple: iron will promote the growth of algae which will provide food for fish and absorb carbon dioxide from the air as they grow. When the algae die their remains fall to the seabed, removing them from the atmosphere. But despite the uncertainty about efficacy and safety, groups and individuals around the world are beginning to experiment, arguing that humanity needs a ‘Plan B' in case countries don't cut greenhouse gas emissions. A draft of a report by the U.N. panel, due for publication in late September and seen by Reuters, warns that the side-effects of sun-dimming geoengineering, for instance, "make it a high-risk strategy" but also concludes that some methods might help avoid some of the worst effects of warming. The Haida are fighting back after the raids of their offices. Despite the government's claim that their experiment was illegal, Haida Salmon Restoration Corp. has not been charged with any crime. The company, which the Haida set up with George, is contesting the legality of the raids, arguing that Ottawa's anti-pollution laws do not apply and that international resolutions lack legal force. Volcanic eruptions also cause algal blooms, the Haida say; the group was merely trying to mimic that process. George, who has long promoted ocean fertilization as a partial fix for climate change, said it is unfair that Kenyan environmentalist Wangari Maathai won a Nobel Peace Prize in 2004 for planting trees while his efforts at sea have triggered mostly vilification. Though the Haida case is relatively small, it is being watched closely by the scientific and legal communities, who worry that a rogue nation or individual will start a large-scale experiment that might go awry. Diplomats and lawyers are racing to lay down laws before that can happen. The ETC Group, a Canada-based non-governmental organization opposed to geoengineering, said even research is risky. "The moment you accept that geoengineering is a Plan B it will become Plan A for some governments," executive director Pat Mooney said. About 700 Haida live in the village of Old Massett on Graham Island on Canada's west coast. Earthquakes regularly shake the island and Pacific storms beat at its forested coastline. A beach at the end of the local airport has washed away in recent years. The numbers of salmon, the mainstay of the local economy, have been falling off western Canada since the 1990s. A government commission set up to examine the decline blamed overfishing, pesticides and climate change. 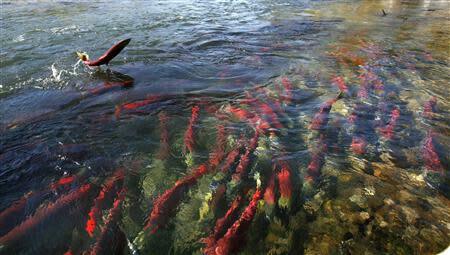 Only 1.4 million sockeye salmon returned to the Fraser River, the biggest in British Columbia, in 2009. That was the lowest since the 1940s and down from more than 10 million some years in the 1990s, the commission said. The Old Massett village council set up HSRC in 2010, hoping to use technology to restore fish stocks. It approached George, seeing him as a crusader for the planet while governments dithered. George had founded Planktos Inc., a San Francisco-based ocean fertilization firm that tried and failed to dump iron in the seas off the Galapagos and the Canary Islands, raising the ire of the Ecuadorean and Spanish governments. The firm went bankrupt in 2008, following the failures. With the help of George, HSRC chartered the Ocean Pearl, a fishing boat, and obtained iron dust made by Maryland-based QC Corp., which mostly sells feed supplement for farm animals. The company said it does not track how firms such as HSRC use its products. 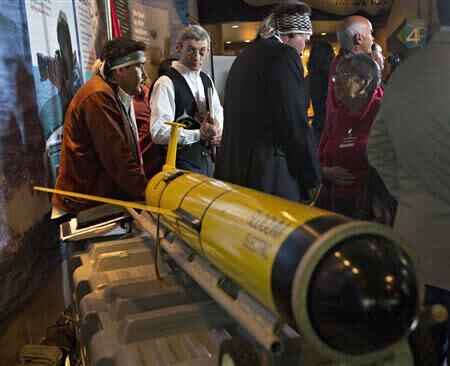 HSRC scattered the iron about 200 nautical miles off Canada, in international waters, last July. Since then, it said it has monitored the area and more salmon, tuna, whales and dolphins have been seen there. "It was an amazing success... (even though) there has been lots of debate, lots of criticism, lots of people throwing rocks," said John Disney, president of HSRC. "We wouldn't have done it if it was illegal." Environment Canada has not assessed whether the experiment worked but other experts say it is impossible to know. 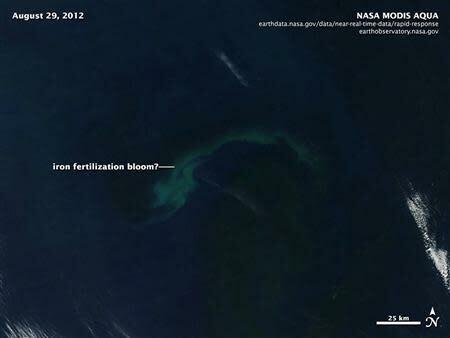 A NASA satellite image from August 2012 showed a bloom of algae in the area but it is unclear if it was caused by the iron dust. "There was no verification... We don't know if (George's) actions had any impacts," said Victor Smetacek, of the Alfred Wegener Institute for polar and marine research in Germany. Smetacek himself carried out an iron fertilization experiment in 2009 in the Southern Ocean and favors the technology. "Iron fertilization is not going to be a panacea by any means but it's the only responsible thing to do," he said. Criticism of HSRC included a statement of "grave concern" last November by the 87 nations in the London Convention, which regulates dumping at sea. "Ocean fertilization has the potential to have widespread, long-lasting and severe impacts on the marine environment, with implications for human health," it said. After the raid, HSRC ousted George from the board in May. One Haida official said they had underestimated criticisms of George's past ventures, which include Planktos and a scheme to plant millions of trees in Hungary. The company itself said it would respond to "legitimate concerns" about its policies. Straith, the HSRC lawyer, declined to comment when asked if the Haida felt misled, or were considering legal action against George. George said he did nothing wrong. HSRC is frustrated that most media reports criticized it and ignored its view that the experiment marked a breakthrough in ocean management. "It's like a doctor announces he has discovered the cure for cancer and the press spends 98 percent of their time reporting on the fact that the doctor is having an affair," Disney said in an e-mail to Reuters. Even so, there were concerns from the start. Canada's Northern Savings Credit Union agreed to help finance the $2.5 million project, which was secured using other Haida funds as collateral, but raised concerns about George, Planktos and ocean fertilization, according to documents prepared by Environment Canada to justify the raids. "We had the impression that Planktos Science was a recognized world authority and that informed scientists generally favored the proposed process," say documents written by the credit union. It expressed "surprise" to find that many experts disagreed with George's theories and urged HSRC to check further. Contacted by Reuters, it declined to comment on the loan. The company had hoped to win credits for burying carbon dioxide in the sea. Economists and U.N. climate change negotiators developed the idea of carbon credits in the early 2000s as a way to encourage a market solution to slowing greenhouse gas emissions. One part of the scheme allowed projects that cut emissions to claim credits that they could cash in. George's Planktos and Hungary ventures were set up with the hope that they could earn such carbon credits. But the U.N. has put off the proposed scheme, in part because it's difficult to verify how long carbon stays in the sea. HSRC, which will contest the legality of the raids in court sometime in the coming weeks, estimates that its experiment absorbed 5 million metric tons of carbon dioxide. Some leaders of the Haida, who total about 2,500 people on traditional territories from southern Alaska to the Haida Gwaii archipelago, disapproved of the experiment. "The consequences of tampering with nature at this scale are not predictable," the Hereditary Chiefs Council wrote in a statement last October. The court documents prepared by Environment Canada say that more than a year before the Haida went ahead with the experiment, on March 22, 2011, a senior government official, Linda Porebski, told a Haida group that the HSRC plan would be considered illegal dumping without a permit. None was granted. "In my opinion this project does not qualify as legitimate scientific research," Porebski said. The draft report by the U.N. panel of scientists says ocean fertilization can have unknown effects. Added iron might create algae locally but rob nutrients, such as nitrogen and phosphorus, from other areas. Extra iron could also produce greenhouse gases such as methane in the sea and increase acid levels in the deep oceans as the waste decays. George, who refers to himself on his website as "Greenfinger" - a play on the James Bond villain "Goldfinger" - told Reuters it was "preposterous nonsense" to say that ocean fertilization could do more harm than good. Salmon in the Fraser River have been declining long term, but Canadian statistics show that 30 million returned in 2010, the highest in a century. George said the surge was caused by the eruption of the Kasatochi volcano off Alaska in 2008 which he said fertilized the ocean with iron-rich ash. Many scientists say the cause of the bonanza is unclear. Disney, of HSRC, predicts more salmon will return to spawn in rivers in 2014 after last year's experiment. One of the first suggestions that geoengineering might help came in 1965, when U.S. President Lyndon Johnson's Science Advisory Committee reported on the risks of rising carbon dioxide concentrations. "The possibilities of deliberately bringing about countervailing climatic changes therefore need to be thoroughly explored," it said. The idea gained attention after the 1991 volcanic eruption of Mount Pinatubo in the Philippines threw up ash that dimmed sunlight, and world temperatures, just as governments were becoming concerned by manmade global warming. Some proposals - mining the moon for dust to scatter as a sunshade for the earth, blasting the earth into an orbit further from the sun - are likely to remain science fiction. But a few ideas, such as spewing tiny sun-dimming sulphur particles - similar to volcanic ash - high into the stratosphere could interest some governments since they are far cheaper than shifting to renewable energies. David Keith, a professor at Harvard University and a co-author of a 2012 study that found it might cost less than $5 billion a year to put a million metric tons of sulphur into the stratosphere, enough to offset the effects of global warming, is planning a small-scale sun-dimming experiment in which he will release about 1 kg (2.2 lbs) of sulphur and 100 kg of water vapor from a balloon at 70,000 feet. He said that the pollution was comparable to that released by an airliner flying for about three hours. "No one can say it poses a risk, but no doubt many people will say it's a bad idea," he said of the planned experiment that he hopes to conduct in about 18 months, depending on permits and public funding. Alan Gadian, a scientist at Leeds University in Britain, has proposed spraying tiny seawater droplets into the air to create clouds to cool tropical coral reefs at risk of overheating. Gadian estimates the plan would cost $400 million a year. "It's a bad idea ... but we need to study it," said Gadian. World temperatures have risen by about 0.8 C (1.4F) since the Industrial Revolution in the 18th century. Two years ago almost 200 nations agreed to work out a climate change deal by the end of 2015 to limit the rise in world temperatures to below 2 degrees Celsius (3.6F) above pre-industrial times. The notion that geoengineering could be part of a fix may gain respectability in September when the U.N. panel of climate scientists issues a report that will seriously consider the technologies for the first time in its 25-year history. The findings by the Intergovernmental Panel on Climate Change (IPCC) fall far short of endorsement. But the fact it is being seriously debated is a big change. Mark Lawrence, scientific director of the Institute for Advanced Sustainability Studies in Potsdam, Germany, said that "the taboo is broken" on theoretical research into climate engineering. That still leaves the issue of where and when potentially climate-altering experiments should be run. Some techniques will cross national borders, potentially affecting millions of people. What if a government or rich entrepreneur goes it alone? A study by Jim Haywood of the UK Met Office, in the journal Nature in March, found that three of the four driest summers in Africa's Sahel region between 1900 and 2010 followed big volcanic eruptions in the northern hemisphere. That suggests sun-dimming particles deliberately spewed into the upper atmosphere in the northern hemisphere could cause drought in Africa, it said. Haywood's study also noted that sun-dimming particles injected into the upper atmosphere might slow warming but would not curb other side-effects of the build-up of carbon dioxide such as more acidic sea water. Then there is the risk of the "termination effect." If governments start geoengineering with a shield of sun-dimming particles, say, but decide it causes too many problems, temperatures could jump if it were suddenly abandoned, according to computer models. At the heart of the physical problems is the lack of a regulatory framework. "The problem is that the international system today has no legal arrangements to prevent unilateral geoengineering," said Scott Barrett, a professor at the Earth Institute of Columbia University. There are some attempts at regulation. The London Convention is trying to work out firmer rules. Australia, Nigeria and South Korea have suggested a formal ban on ocean fertilization. But Jon Egill Kristjansson, an Icelandic scientist at Oslo University who has won $1.14 million for a computer-based review into ways to make high-altitude cirrus clouds trap less heat, argues humans are already unwitting geoengineers by burning fossil fuels in cars, factories and power plants. "We're doing inadvertent climate engineering all the time and there is no regulation. It's not entirely logical," he said.